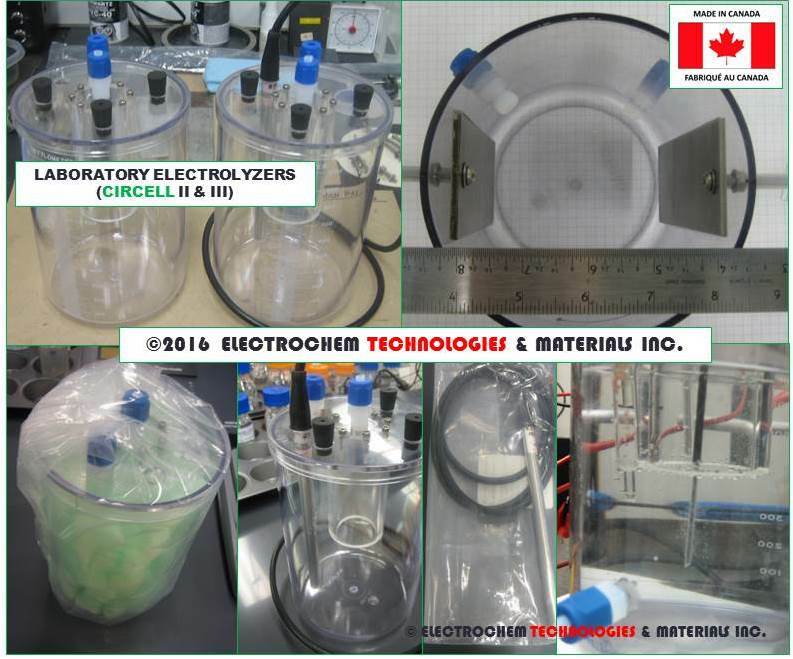 ELECTROCHEM TECHNOLOGIES & MATERIALS INC. has built since 2010 a plethora of custom made small scale electrolyzers with a total electrode surface area ranging from only 100 cm2 up to 0.929 m2 mainly for laboratory screening tests and scoping studies in alkaline or acidic electrolytes. 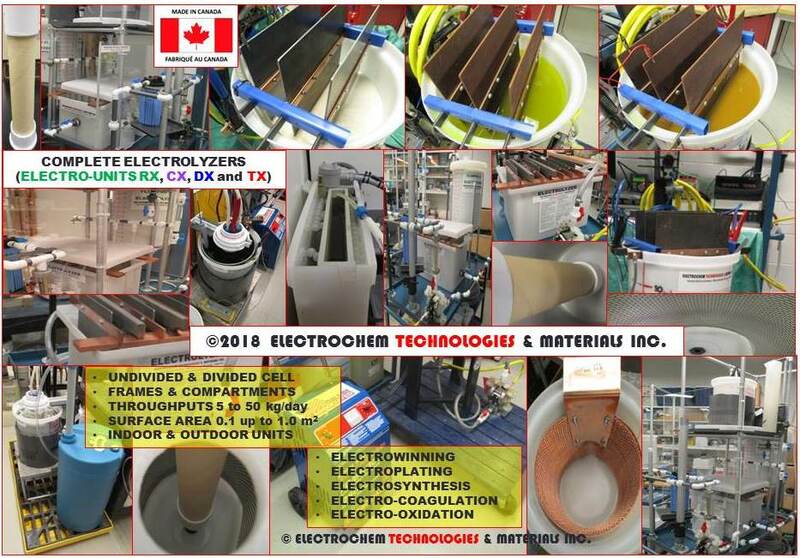 Larger prototype scale electrochemical reactors, with a total electrode surface area ranging from only one square foot (929 cm2) up to fifty (50) square feet (4.645 m2) were constructed for testing various electrochemical processes or preparative electrochemistry either in-house or for customers from the mining, metallurgical, and electrochemical industries at their plant worldwide. 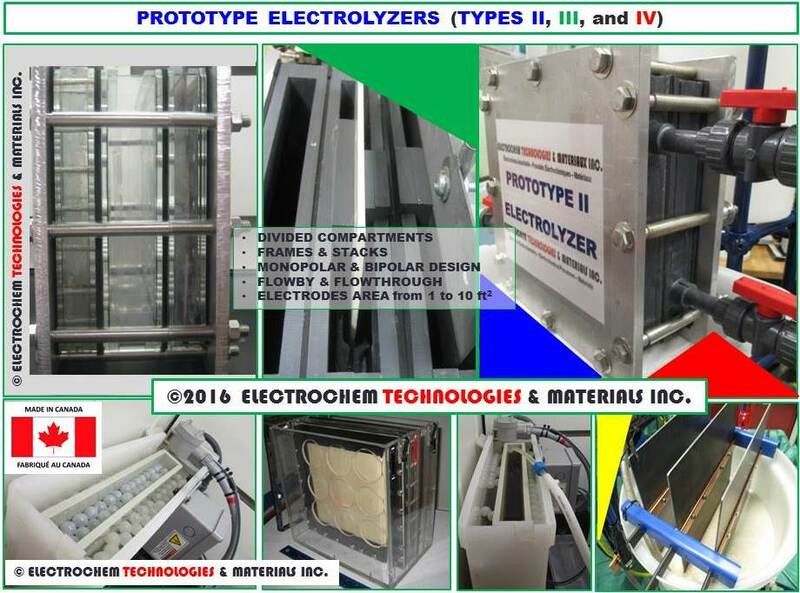 This robust and cost affordable electrochemical unit is built around our PROTOTYPE II or FLOWPRO III electrolyzers. This semi-pilot unit unit offers a total electrode surface area ranging from two square feet (0.186 m2) up to ten square feet (0.929 m2). 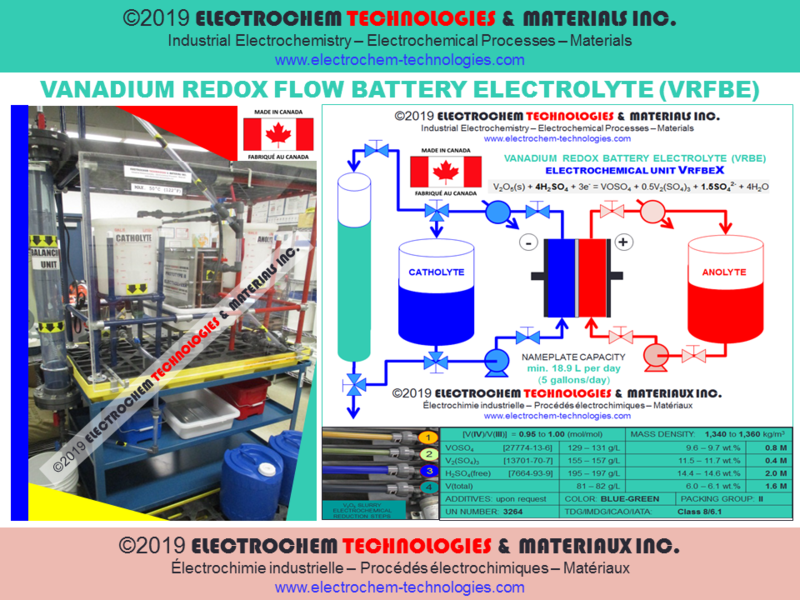 It is used for pre-piloting trials and the small scale commercial production of all vanadium redox flow battery electrolyte (VRFBE) or other redox battery electrolyte chemistries [e.g., cerium (IV)/(III), iron (II)/(III)]. The nameplate production capacity starts at 18.9 L per day (5 gallons/day) up to 60L per day (15 gallons/day) of equimolar vanadium redox flow battery electrolyte [i.e., 1.6 M V(total), 2.0 M H2SO4 (free) and with a molar ratio V(IV)/V(III) = 1.0]. Design: rectangular plates and frames combined with auxiliary tubular balancing unit. Cell construction material: polyvinylchloride (PVC), chlorinated-polyvinyl chloride (CPVC), polypropylene (PP). Piping material and size: CPVC and PVC [NPS Schedule #80]. Configuration: divided by ion exchange membranes in two or multiple compartments. Electrodes: plates, three-dimensional (mesh and expanded metals). Gasketing: EPDM or fluoroelastomers PVHF (VITON®). Electrolyte circulation: anolyte and catholyte storage tanks, turbulent promoters. Internal flow circulation: flow-by, flow-through, manifolds, distributors, serpentine. Electrodes assembly: monopolar or bipolar stacks. Back plates: aluminum 6061 T6, stainless steel AISI 316 tie rods and Belleville compression springs. Cooling: coiled immersed chillers and plate heat exchanger. Pumping: air-operated diaphragm pumps, centrifugal pumps, ball valves. Mixing: inert gas sparging, impeller, in-line static mixer. Electrolyte holding tanks: (2 x 5 gallons) up to (2 x 15 gallons). Instrumentation: pH, ORP, temperature, and toroidal conductivity probes, pressure gauges, rotameters. Electrical connection: copper C101 busbars, copper cables AWG. No. "1/0" to No. "3/0" (106 to 212 kcmil). Use: indoor unit mounted on heavy steel duty cart (1200 lb.) with spill containment trays. These complete electrochemical units offer a total electrode surface area ranging from four square feet (0.371 m2) up to fifty (50) square feet (4.645 m2). These are commonly used for pre-piloting various electrochemical processes either in alkaline or acidic electrolytes. When equipped with electrolytes holding tanks they allow to operate in recirculating mode. Impellers, pumps, valves, rotameters, strainers, filters, can be also provided. Internal or external heating could be ensured by installing PTFE-coated or quartz immersed heaters to resist corrosion and harsh operating conditions. Types: rectangular or cylindrical tanks with conical bottom, plate and frames, tubular and coaxial with separator. Piping material and size: CPVC, PVC [NPS Schedule #80], stainless steel, PFA. Configuration: undivided, divided with two or more compartments. Compartment access: open access, partially or entirely closed. Electrodes: plates, rods, tubes, three-dimensional (mesh, expanded metal, felt, and wool). Electrolyte circulation: anolyte and/or catholyte storage tanks with inlet and outlet, turbulent promoters. Internal flow circulation: flow-by, flow-through, distributor, serpentine. Back plates: aluminum 6061 T6, stainless steels AISI 304 or AISI 316, and titanium ASTM Grade 2 and 5. Heating & Cooling: immersed heaters, and heat exchangers. Pumping: air-operated diaphragm pumps, centrifugal pumps, valves, rotameters. Mixing: gas sparging, impeller, in-line static mixer. Purification of electrolyte: connection to ion exchange (IX) columns. Electrolyte holding tanks: from 10 gallons up to 55 gallons or connected fo FIBC containers (252-279 gallons). Solids removal: inline filters or strainers, filter-presses, or disk centriguges. Uses: Indoor or outdoor units mounted either on carts, platforms, skids or containers (40-FEQ). 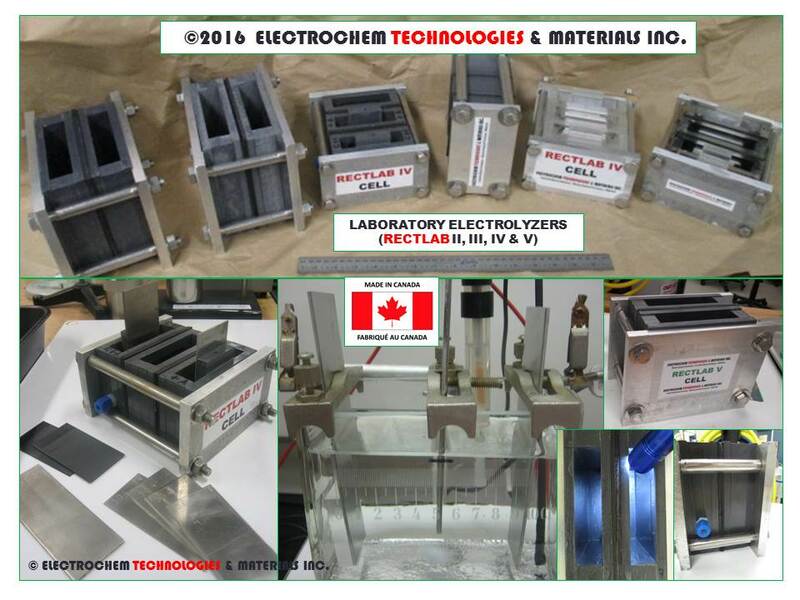 The prototype electrolyzers offer a total electrode surface area ranging from one square foot (929 cm2) up to ten square feet (0.929 m2). These are commonly used for testing various electrochemical processes either in alkaline or acidic electrolytes or redox flow battery stacks (e.g., vanadium (IV)/(III), cerium (IV)/(III), iron (II)/(III), and other chemistries). Eventually, impellers, pumps, valves, rotameters, strainers, filters, can be also provided with immersed heater or small heat exchangers. Gasket materials: EPDM, Fluoroelastomers (VITON®). Piping material and size: CPVC, PVC, stainless steel, PFA. Compartment access: open access or entirely closed. Electrolyte circulation: anolyte and/or catholyte inlet and outlet, turbulent promoters. Back plates: aluminum 6061 T6, stainless steels AISI 304 or AISI 316, and titanium ASTM Gr. 2 and 5. Assembling: clamps, hexagonal head bolts, washers and nuts, compression springs, and tie rods. Heating: immersed heater, heat exchanger. The small scale electrolyzers offer a total electrode surface area ranging from only 10 cm2 up to 400 cm2. These are mainly used for laboratory screening tests and scoping studies either in alklaine or acidic electrolytes. Eventually, anolyte and catholyte auxiliary tanks can be also provided with immersed heater but it is usually cheaper for the customer to purchase directly the ancillary equipment himself. Cell construction material: Polyvinylchloride (PVC), Chlorinated-Polyvinyl chloride (CPVC), Polymethylmetacrylate (PMMA), Polycarbonate (PC), Polypropylene (PP), PEEK. Compression fittings material and size: stainless steel, titanium, PFA, with tubing outer diameter. Electrolyte circulation options: peristaltic pump, anolyte and/or catholyte inlet and outlet, turbulent promoters. Back plates: aluminum, stainless steel, and titanium. Assembling: clamps, bolts and nuts. These small scale electrolyzers offer a total electrode surface area ranging from only 10 cm2 up to 100 cm2. These are mainly used for laboratory screening tests for the benchmarking of coupons of commercial electrodes either in alkaline or acidic electrolytes. The clear design allows to vizualise the gas evolution. Cell construction material: Clear Polyvinylchloride (PVC), Polymethylmetacrylate (PMMA), Polycarbonate (PC). Compression fittings material and size: PFA with tubing outer diameter. Electrolyte circulation: electrolyte inlet and outlet. Backplates: aluminum, stainless steel, and titanium. Assembling: clamps, bolts and nuts, tie rods. Ancillary equipments: pumps, impeller, mixer, valves, filters. Keywords: industrial electrochemistry, electrochemical engineering, electrochemical processes, electrothermal processes, transfered and submerged electric arc furnaces, aluminothermic and carbothermic reduction, ferroalloys, electrofused ceramics, materials engineering, materials science, materials data, properties of materials properties, aqueous electrolytes, molten salts, fused salts, electrolysis, electrode kinetics, corrosion science, electrodeposition, electrowinning, electrorefining, electrocatalysis, electrooxidation, electrocoagulation, electrofloculation, electrodes, cathodes, inert anodes, dimensionally stable electrodes, chlorine evolution, oxygen evolution, mixed metal oxides (MMO), activated titanium anodes, oxide coated titanium anodes, lead anodes, refractory metals, molten slags, liquid metals, lithium, cesium tungstate, titanium, zirconium, hafnium, vanadium, vanadium pentoxide, vanadyl sulfate, ammonium polyvanadate, sodium metavanadate, vanadium redox flow battery electrolyte (VRFBE), vanadium electrolyte production, VanadiumCorp-Electrochem Processing Technology (VEPT), niobium, tantalum, chromium, molybdenum, tungsten, rhenium, rare earth elements, thorium, uranium, extractive metallurgy, pyrometallurgy, hydrometallurgy, electrometallurgy, natural radioactivity, recycling, mining residues, metallurgical wastes, industrial wastes.